Athena Gris Marble (Taupe/Grey) has unusual veining that looks like woodgrain. Most of the tiles also have very fine crystalized cross veins which are an inherent part of thee marbles (they are not fault lines). Honed finish. 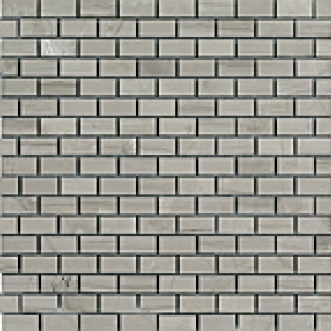 Linear and Brick Patterns are well known mosaic styles. Echelon Mosaic is a new pattern that is modern and trendy. Versailles Mosaic presents this traditional pattern in a compact (Nominal) 12" x 12" sheet. Commercial or residential wall use and residential floors.